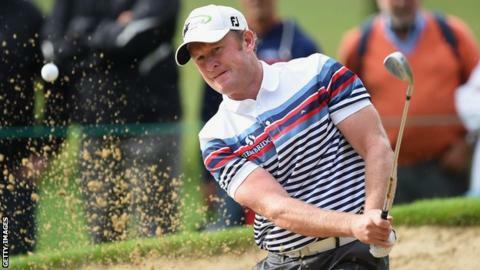 Jamie Donaldson will go into his first Ryder Cup in a "strong position" according to Europe team captain Paul McGinley. Donaldson, 38, secured an automatic place in the European team by winning the Czech Masters. McGinley says Donaldson goes into next week's event in Scotland full of confidence. "He's earned a huge amount of points to make this team and he's made this team quite comfortably in the end," he said. "He went out in the second to last counting event and won it in order to put himself in the team. "Psychologically that puts him in a very strong position to play his first Ryder Cup. "I have no doubt he'll hit the ground running when he gets to Gleneagles." Donaldson, Lee Westwood, Stephen Gallacher and Thomas Bjorn will be preparing for the Ryder Cup in Scotland next week by playing in the Wales Open at Celtic Manor. McGinley, who won the Wales Open in 2001, requested the Celtic Manor course to be set out like Gleneagles. Pontypridd-born Donaldson is aiming to become the first Welsh winner of the tournament, which has been held for the past 15 consecutive years but will come to an end this year. He has won three times on the European Tour, including August's Czech Masters, and McGinley believes Donaldson's versatility and popularity will be vital. "He's a guy who is going to be easily paired," Irishman McGinley added. "A lot of guys are happy to play with him and it's not just his golf, it's his personality as well and we'll all enjoy him being around the team both on and off the course. "He's great to be around and he's going to be great for the team atmosphere. "I've worked with him in the past in the Seve Trophy and he's a great guy. "But the big thing Jamie's going to bring to the party is the fact he burst over the line."